The USB Type-C port is the successor to the micro-USB port, and it will finally come to mid-range smartphones in 2017. We've had a great experience of it so far in its first year so we'd like to share with you why we think it's so much better than its predecessor. What’s behind the Type-C connector? The USB Implementers Forum, which is the industry association behind the port, has learned from its mistakes with micro-USB and created better specifications for the Type-C. Chargers with a Type-C port are quicker across the board and generally charge your smartphone at 15 watts. That's five times quicker than most chargers using the old port. And best of all: it’s easy on your battery. Both ends of the cable not only look the same, they can also do the same things on both ends, which means you can determine in which direction the current flows. 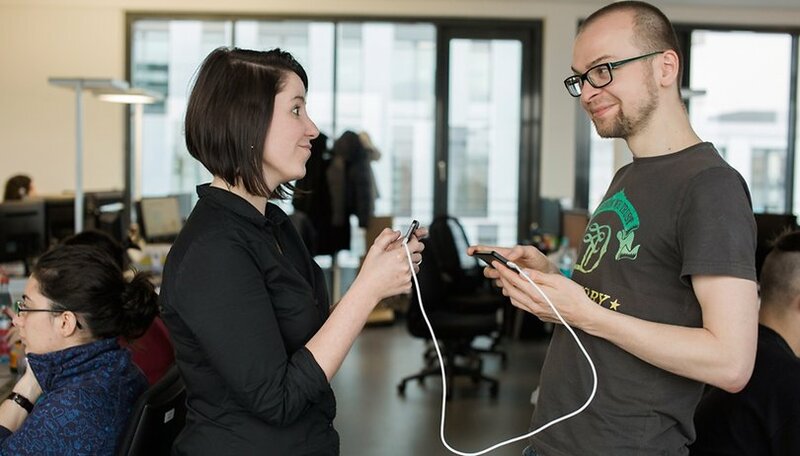 In some cases, it leads to funny results where your smartphone starts charging the power pack. If you still have enough juice for the coming hours, you can actually help out a friend by charging their cell phone using the juice left from yours. To do so, connect both smartphones and direct the power flow. You can open the menu for it using the attached notification. Do you want to quickly copy images or music from one smartphone to another? If you have Android Marshmallow and a Type-C port, then you’re good to go. Android can detect a smartphone on the other end of the cable and offers to share your data. You just need to open the file explorer on the device where you wish to receive the files. This is a pre-installed app on many manufacturers’ smartphones but otherwise, it can be found in the storage settings under search. USB (Universal Serial Bus) is a standard that defines the cable, connectors and digital data exchange. The first version originated in 1998 and replaced PC interfaces that were customary at that time. The USB Type-C connector has been defined since 2014. It has more connectors than its predecessor, and they are symmetrically arranged. As a result, it doesn’t matter which way round you insert the cable. There are a lot of differences between the various connectors and USB versions. They have different electrical specifications and data rates. USB A and B connectors only have 4 pins, whereas USB 3.1 Type-C has 24 pins, which are required to support higher currents and faster data transfer rates. Furthermore, the separately specified USB 3.1 standard increases speeds up to 10 GB/s, and there are innovative ways to power devices. The Type-C port specification requires the connector to withstand being plugged in 10,000 times without showing signs of wear. If used twice daily, that would last you over thirteen years. To meet these specifications and handle the increased power flow, USB-C cables are mostly thicker than the classic cable. Most Android phones so far have had a micro-USB port. In most cases, it charges devices at 5 volts and roughly 2 amps. A faster charging speed can only be achieved outside the USB specification: Qualcomm Quick Charge, Oppo Vooc and Samsung Adaptive Fast Charge are manufacturer standards that only work on devices of a certain brand. The Type-C port allows for a power supply of up to 100 watts using the open, royalty-free, industry-standard power delivery, limited only by the cable, power supply or target device. To minimize heat build-up and aging in electronic components, standards-compliant devices continuously negotiate voltage and current with one another. To recognize them, look for the USB charger logo that was agreed upon in August 2016. AndroidPIT regularly tests chargers and power banks that use the new standard for your benefit. Your smartphone will charge quicker and safer but be sure to pay attention to the quality of the cable, too. Google employee Benson Leung has already tested over 100 cables, some of which have caused damage to one of the connected devices. Type-C connectors can replace many other cables. The certification process for many signals and protocols has already been completed. These include VGA, DVI or HDMI, where the Type-C port mimics a display port, including protocol conversion. Of course, this requires the appropriate hardware and software behind the port, and the declaration can also be found in official documents. Audio is also a hot topic, since the headphone jack is slowly disappearing, see Moto Z. The USB Implementers Forum came to a standard for this at the end of September 2016. The USB Audio Device Class 3.0 specification requires digital audio transfer. As a result, the Type-C jack adapter must have a digital audio converter, which would still be compatible with all your Type-C devices. Even though an increasing amount of smartphone manufacturers are including a USB Type-C port, they mostly still implement the USB 2.0 standard electrically instead of the up-to-date USB 3.1 standard. This is a problem when transferring substantial amounts of data from a device to another, since the internal storage of most smartphones now exceeds the roughly 30 MB/s speed of a USB 2.0 port. Do you use a device with USB Type-C? What has been your experience with the new standard so far? Know what parts of the spec your phone maker actually supports. OnePlus has not supported much more than the connector on its prior implementations for example.